Legal Help for British Columbians is a resource for non-legal professionals in British Columbia who have clients with legal problems and little money to deal with them. For over 40 common legal problems, the Guide provides first steps to address the problem and options for further information or help. The Guide can also be used directly by those seeking assistance with their legal problem. 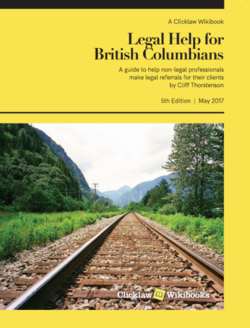 Originally published in 2008 under the title "Legal Help for Rural British Columbians", Legal Help for British Columbians is now in its fifth printing. In March 2012 the guide went online to become the first Clicklaw Wikibook. Clicklaw Wikibooks are collaboratively developed, plain language legal publications that are published and kept up-to-date on a wiki, where they can also be printed and downloaded. Learn more about Clicklaw Wikibooks. Leading the writing of this Guide is founding author Cliff Thorstenson, who works with a team of lawyers and editors in updating the guide on this wiki. Find additional plain language, practical legal information on Clicklaw. Find law-related help on the Clicklaw HelpMap. This page was last edited on 23 May 2017, at 16:02.